Like many first-year teachers, I found myself in a classroom that was lacking many of the “essentials.” I was suddenly faced with the reality of teaching with limited resources, scattered materials, and low staffing ratios. It was then I realized that I would need to find a way to keep my students, who spanned grades Pre-K to 3, independently engaged in learning activities. I was scouring the website Teachers Pay Teachers looking for ideas, when I came across the Original Task Box Bundle by Especially Education. Initially, I included 16 activities from that first pack to utilize within my classroom. I focused on choosing a variety of activities and levels of difficulty that would accommodate the needs of all my learners. I was also happy to discover that Michaela designed each activity to fit perfectly into a 4×6 photo case. When I first introduced the task box system, it was a slow process. My students needed to be explicitly taught “how” to use the system. They were encouraged to pick three activity pictures from a binder, put them on the schedule strip, and then choose the three corresponding boxes. My hope when I initially implemented this system was that I could teach them to work independently for short periods of time. This would allow me to cater to all my students needs, despite our low staffing ratios. 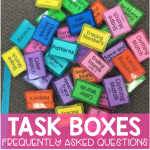 However, through the course of the school year, these task box activities became so much more. By June, my students not only understood the system, but were able to complete the activities so quickly and easily, they were no longer a challenge. Michaela released the Monthly Task Box Bundle around this time, and I started prepping our bins for the following school year. Instead of rotating them out monthly, I decided to add to what we had and align them more closely to my student’s current IEP objectives. By the start of the 2017- 2018 school year, I had added three more sets of 16, to our collection. Michaela added more complex schedule strips to future task box packs. I split the tasks into early/advanced learner and subject areas. This helped me, and my paraprofessionals, guide students toward activity choices that matched their ability level. The addition of new tasks also meant finding ways to organize the activities so my students, many of whom were non-readers, could remain as independent as possible. I created activity choice mats, which could be displayed in front of each bin. These mats helped students locate the task box they needed by the placement of the corresponding picture. At the end of each day, my paraprofessionals and I reset the bins for the students making sure any additional materials (dry erase markers, clothespins, visual supports etc.) were in working order. Similarly to when we started out, it took some structured teaching for students to become independent with the revised system. However over time this became one of their favorite and most requested activities of the day. Even though there are 64 activities to choose from, there is something about the structure and routine of these task boxes students are drawn to. 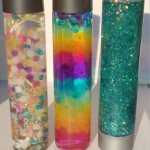 They take immense pride in showing off their finished work, keeping all the materials together, and putting the tasks away into their rightful places. Especially Education’s task box activities were one of the best things to happen to our classroom.